Pip Wilson bhp: A caterpillar is nothing like a butterfly but one develops from the other. 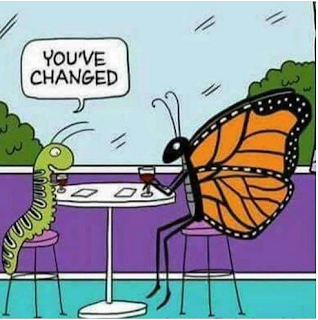 A caterpillar is nothing like a butterfly but one develops from the other. I sat in a circle of YMCA Hostel Residents. We talked about the potential in a caterpillar and shared our collective wisdom. They had a free choice to join me. I had pushed an invitation under each bedroom door. A dozen out of 100 joined me. An acorn is the soul of an oak tree. An acorn has the potential to become an oak tree. from developing into its full potential. Uprooted or eaten in early life and more. become a fully alive human person. What can hinder that development? "The glory of God is a person fully alive”. shared the reality of their own 'damage’. and also the equipping for life that this sometimes gave. child care, training, sporting opportunities and more. to provide developmental opportunities for all. We are about whole person development. That is what makes the YMCA distinctive. That is what we mean by putting Christian principles into practice. "An empty belly has no ears,"